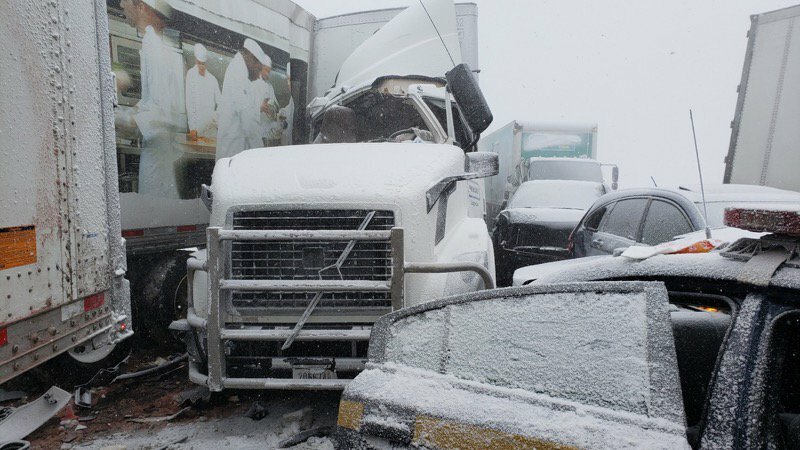 This photo from the New York State Police shows a portion of a multiple-vehicle crash that closed the eastbound lanes of the Thruway near Batavia Wednesday afternoon. Twenty-one vehicles, including tractor trailers, were involved in a crash on the eastbound side of the Thruway near Batavia Wednesday afternoon, state troopers said. The incident left a trooper with a possible broken leg. The crash was reported at about 2 p.m. near the 382 mile marker, police said. All eastbound and westbound lanes in the area of the crash were closed as of about 3:45 p.m.
"Traffic is being diverted eastbound at Pembroke exit (48A) and Batavia (Exit 48) and westbound at Leroy (Exit 47)," troopers said in a statement. State Police Sgt. Sean O'Rourke of the Thruway barracks said one of the crashes involved a tractor-trailer – which wasn't supposed to be on the road due to a previous ban – striking a trooper's patrol vehicle. The trooper was on her way to Strong Memorial Hospital in Rochester for treatment of a possible broken leg, O'Rourke said. The Thruway lane closings are coupled with a travel ban issued for all of Genesee County. Stay with us after the storm. Sign up today for a 30-day free trial to BuffaloNews.com.